She is dubbed as ‘the face of future soul’ in Australia and is gaining a reputation as one of the country’s most exceptional and dynamic vocalists. She was also listed in Triple J’s 2010 Next Crop list together with Kimbra, Lanie Lane and The Jezabels. 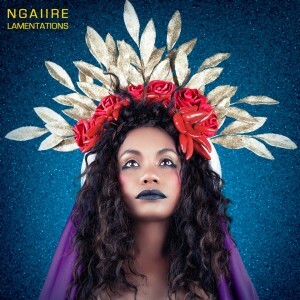 Although Lamentations is only her debut album, Ngaiire (pronounced Nigh-rie) is no stranger to the live music scene. The Papua New Guinea native and Sydneysider first captured the public’s attention as a wildcard semi-finalist on Australian Idol in 2004. She has also toured constantly over the years across Australia and overseas with acts such as Blue King Brown, Monsieur Camembert, The Presets and her mentor Paul Mac. Now having established herself as a singer-songwriter and a powerful performer, Lamentations could strongly develop her following across the Australian music industry. Lamentations offers an emotional journey through beautifully passionate Erykah Badu-esque vocals, meaningful lyrics and a creative blend of folk, electronic, funk and indie pop sounds that are all infused with soul. The whole album is also short and sweet with only nine tracks and running just over 30 minutes. The album opener Uranus gives an interesting greeting with the lines, “Welcome, come sit down – can I order you a drink or would you rather just sit there and watch me think.” The following line, “Heads up so you know, it can get pretty messy round here…” sounds like a warning to listeners about the lamentations and issues that will unfold across the later tracks. Still, the song can get your head bopping straight away with its casual groovy feel. First single Dirty Hercules features guest vocals from Nai Palm of the electro-soul group Hiatus Kaiyote and is co-written by Barry Southgate, fellow Australian Idol 2004 semi-finalist and Top 24 finalist in this year’s The X Factor. The song touches on issues of competitiveness, insecurities, how people relate to each other and always trying to get ahead. You’ll hear fierce lyrics like, “If you’re gonna pick a fight, why don’t ya, why don’t ya?” Both the lead and backing vocals gradually become feistier towards the end of the song. One of the most unique beats is in Count to Ten where you’ll hear typewriter tapping sounds crackling along to the piano. The following track Fireflies is a truly beautiful ballad that sounds heavenly and is also gripping with its throbbing drums. ABCD is the album’s most outstanding track with a similar cinematic sound of a Lana Del Rey ballad. Ngaiire’s yearning and bleak vocals perfectly accompany the dark beauty and melancholic piano notes in this powerful ode to her mother. Lamentations is just the beginning for Ngaiire’s promising career as a neo-soul songstress. Her sultry vocals, gorgeous harmonies, lyrical substance, eclectic sounds and the album’s intricate production make it a nicely well-rounded debut.